Last week, Bajaj Auto Ltd had reported a 94% increase in Ebit, though from a lower base. For Hero Honda, it was on the back of a much lower 21.7% rise in volumes. Profits rose at a higher rate due to higher realizations because of a higher proportion of premium bikes and lower raw material costs owing to the drop in commodity prices. Like Bajaj, Hero Honda’s performance improved quarter-on-quarter. Although average sequential realizations were flat and raw material costs rose marginally, operating margin increased by 132 basis points. One basis point is one-hundredth of a percentage point. The company has also been gaining excise benefits by shifting more of its production to Haridwar in Uttarakhand. This has helped increase net profit margins. So while profit before tax rose by 71% year-on-year in the last quarter ended September, net profit rose by as much as 95% to Rs597 crore owing to the tax breaks. This is about 14% higher than the consensus estimate of 11 analysts polled by Reuters and should help the company’s stock in the near term. The scrip has corrected by about 10% from a high of Rs1,775 reached in late July this year. In the recent past, it has been weighed down by an employee strike at Rico Auto Industries Ltd, a major supplier to the company. In the same period, shares of Bajaj Auto have risen by 26%, thanks to a stellar performance of its newly launched bike branded Discover 100. In fact, shares of Bajaj Auto have outperformed those of Hero Honda by a wide margin this whole year (see chart). Hero Honda’s business has not been underperforming, though. Even as Bajaj Auto’s volumes have fallen by about 2% in the first six months of this fiscal that began on 1 April, Hero Honda’s have risen by 23%. Bajaj’s shares have been playing catch-up in terms of valuations and the recent pickup in its volumes just speeded that process. At current levels, Bajaj trades at only a 6-7% discount to Hero Honda in terms of price-earnings multiples. 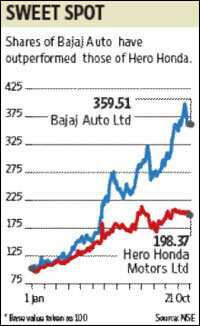 The main reason for investor preference for Bajaj Auto shares—low valuations—has, therefore, disappeared and Hero Honda shares should do equally well, if not better than its smaller competitor, from here on.